A sign from a Jan. 9, 2019 missing and murdered Indigenous women vigil in Missoula. Montana lawmakers are no closer to agreeing on who should fund a missing persons bill after a hearing Tuesday in the Senate Judiciary Committee. House Bill-21, or “Hanna’s Act” is named for a Northern Cheyenne woman who was murdered in 2013. The bill would create a position in the Montana Department of Justice to investigate every missing persons case across the state, in an attempt to bridge gaps in communication and jurisdiction between state, tribal and federal agencies. While the bill originally allocated $100,000 from the state to fund the new position, the House Judiciary Committee stripped it away last month. The de-funded bill passed the House 99-0, but is now creating uncertainty in the Senate over who should be responsible for paying for the missing persons specialist, and how the bill will function if no money is allocated. John Barnes, communications director at the Montana Department of Justice, said his agency does not have enough resources to create the position. But he says the DOJ still wants to see the bill passed. Rep. Sharon Stewart Peregoy (D) - Crow Agency says the yearly $100,000 appropriation that was cut in the House committee wasn’t a big ask. "What is the cost of an individual’s life? It comes down to that. What is the cost of public safety?" Sen. Jennifer Fielder (R) - Thompson Falls, noted at the hearing that the bill has garnered a lot of support from Native American communities who hope it will address the crisis of missing and murdered indigenous women and girls. Fielder questioned why tribal governments weren’t stepping up to cost-share the salary of the specialist. But those in favor of HB-21 say that missing and murdered cases are not exclusive to Montana’s reservations and that this isn’t just a reservation problem. 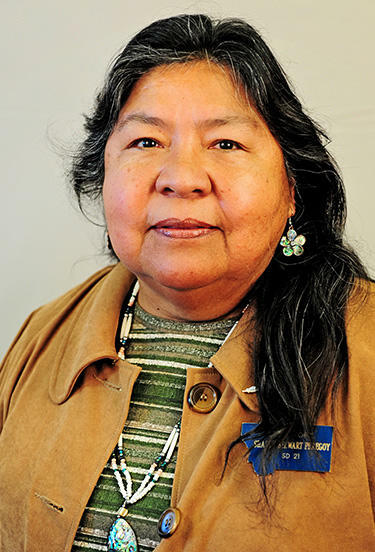 Iko’tsimiskimaki “Ekoo” Beck, an organizer with Montana Women Vote, is an enrolled Blackfeet member. Beck doesn’t live on the reservation. She says she pays taxes to the state of Montana and that tax dollars should go toward funding the bill. "We are the constituents of these electors. We are state citizens. We are citizens of the United States. We're not just members of a tribe. We live everywhere. It’s not just our tribes' responsibility." A motion to restore the funding already failed in the House Appropriations Committee on a vote of 10-to-12. No vote was taken on the bill Tuesday. Human remains found last year on northwestern Montana’s Blackfeet Indian Reservation do not belong to a 20-year-old woman missing for almost two years. The FBI Laboratory in Quantico, Virginia announced Friday that its analysis of the remains found December 13 are not those of Ashley Loring HeavyRunner who disappeared in June of 2017. On Saturday, as Women’s Marches happened across the country, about 500 people turned out for an un-affiliated demonstration in Missoula: A vigil for missing and murdered indigenous women and girls. Among those at the State of the Union address in Washington, DC last night was was a 29-year-old stay-at-home mother of two from Missoula. Briana Lamb is also an activist on the issue of missing and murdered indigenous women. She was Senator Jon Tester’s guest.